Posted January 18th, 2019 by Media Heroes. Exercising in summer is hard. The sun is strong, the heat is high, and the temptation to swap a cold drink for a hard cycle is ever-present. But cycling in summer is a Queensland necessity – after all, our summers are that little bit longer! 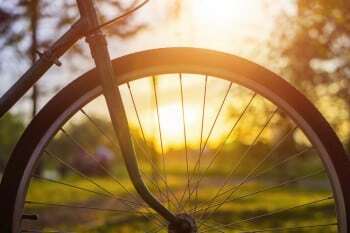 Luckily, there are a few things you can to do make your summer cycling experience easier, and a bit more comfortable. Among those things is bike preparation. If you prepare your bike effectively for summer, you’ll find summer cycling much easier. Riding on an ill-prepared bike is tough at the best of times, so treat yourself to an easy ride with these tips! Bike tyre pressures: prepare your tyres so you don’t have to work too hard in summer! Tyre pressures are vital when it comes to summer cycling. That’s why the first thing to do when preparing your bike for summer is check the tyre pressures. It might seem pedantic, but it’s surprising how much of a difference tyre pressures make. If you’ve ever ridden on near-flat tyres before, you’ll know the sluggish feeling. Generally, your bike tyres should have just a little give in them, if you press firmly with your thumb. If you have a performance tyre, we suggest checking the manufacturer’s specifications. They will usually have a recommended pressure range on the tyre sidewall. If you adhere to that, your ride will be much less resistant! If your bike hasn’t seen much use of late, it may be feeling a little stiff. Normally, this is caused by rust and dust along the driveline. You probably won’t think much of it while you’re riding, but it can actually create an added layer of resistance. When the summer sun is beaming down on you, that’s the last thing you want. So when you’re preparing your bike for summer, make sure everything is well lubricated. WD40 is always a good allrounder, and inox is another tough lubricant you can use. But make sure you keep it clear of the brakes! It’s a small way to prepare for summer, but adding a drink bottle holder to your bike makes a difference! If your bike is in great condition, and you maintain it religiously, you won’t have much to prepare for this summer. Chances are, your bike is prepared for anything! But often, it’s the little things that make the biggest difference. One such thing is a drink bottle holder. If you don’t have one fitted, we strongly recommend giving it some thought! The simple act of making your water bottle more accessible can make your ride a great deal more comfortable. And more comfortable rides are more appealing, so it can even act as encouragement! Preparing your bike for summer is important, but if your bike is on its last legs, there mightn’t be much you can do. If that sounds like your situation, an upgrade might be the best way to prepare you for some summer cycling. A brand new bike is the perfect motivation to get out there, even when it’s hot, and enjoy all that Queensland cycling offers. Finally make sure you’re prepared for summer – not just your bike! Of course, preparing your bike for summer is important. But the most important thing to do is self-preparation – are you prepared for summer? Keeping hydrated, dressing in a sun safe way, and carrying sunscreen are all far more important than bike maintenance. So visit your local cycling store and pick up the essentials this summer – not just for you bike, but for you too! To learn more about the best commuter bikes, contact us.